Check out some delicious Greek recipes for your Easter table. Get more from Kellari Taverna. In a stainless saucepan, bring all of the above ingredients to a simmer for an hour. Strain and cool for a day at room temperature. In a stainless saucepan, add the eggs and the red dye and simmer for 20 minutes. Remove from heat and leave the eggs in the pot until desired color is reached. Wash the Offal’s of the lamb very thoroughly and cut them in medium size pieces. Season with salt, pepper, oregano and olive oil. Start skewering the Sweetbreads, Hearts and Liver in the 18 inch iron skewer alternatively. Wrap the Kokoretsi with the cull fat and run the lamb casings until the whole skewer is covered. Kokoretsi must be preferably roast on a spit until fully cooked for about 1 ½ hrs or cook in a 400 degree oven for 1 ¾ hrs. When cooked allow to rest for 15 minutes. Slice ½ inch rounds, season with dry oregano and serve. 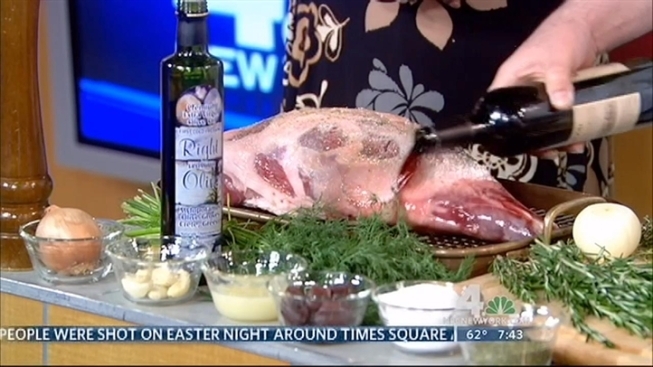 Using your hands, rub the lamb with the Extra virgin Olive Oil and lemon juice. Insert the garlic and the rosemary in the meat making small incisions evenly all over the surface of the meat. Season the meat with the salt and pepper and place the lamb in a roasting pan over the sliced onions and add the red wine . Reduce the oven temperature to 325 degrees F and continue to cook for about 1 hour longer for medium-rare, or until a meat thermometer inserted into the center of the roast registers about 145 degrees. Remove the lamb from the oven and allow lamb to cool for 20 minutes before serving.